DIDEROT, Denis – ALAMBERT d’ Jean.. Encyclopédie ou dictionnaire raisonné des sciences, des arts et des métiers, par une société de gens de lettres. 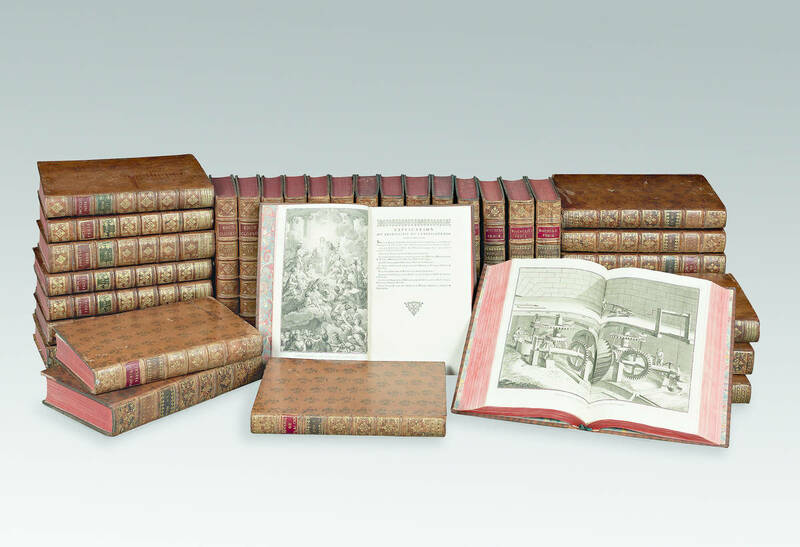 35 volumes, comprising 17 volumes of text, 12 of plates, 4 of supplement and 2 of tables. Folio (390 x 246 mm), half titles, woodcut device on title-pages, some woodcut initials, head and tail pieces, 7 folding letterpress tables, a few woodcut illustrations and 2795 engraved plates (some doublepages or folding). Contemporary marbled calf, spine gilt in compartments, red edges. Occasional foxing and spotting, one volume with a pale waterstain, spines lighty cipped, extremities rubbed; overall a very good set uniformely bound. First edition of the enlightenment's monumental contribution to universal knowledge, a monument in the history of European thought. 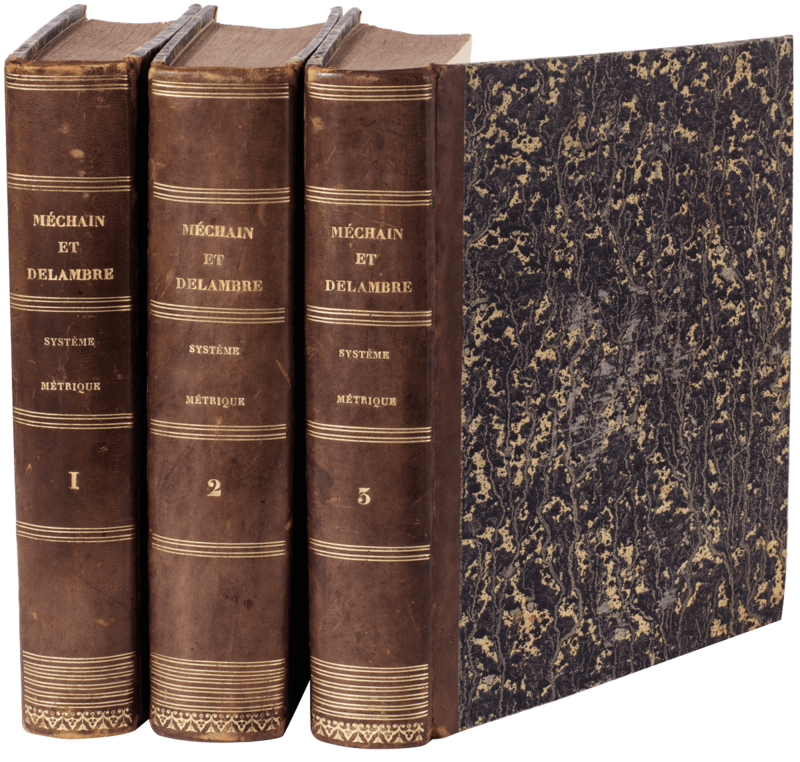 The Encyclopédie was the result of a massive collaborative effort, with contributions by the leading French intellectualas of the day, including Rousseau, Voltaire and Montesquieu. “Its beginning gave no inkling of its future importance. In 1745 the Paris publisher André-François Le Breton was approached by the English agriculturist John Mills and an otherwise unknown German writer, Gottfried Selle, with a proposal for bringing out a French translation of Ephraim Chambers's Cyclopaedia; in fact, the preamble to the first volume of the Encyclopédie still refers to the ‘dictionnaire anglois de Chambers, d'Haeis, de Dyche, etc' as its main sources. Meanwhile, however, the plan had taken a different, far more ambitious shape. Le Breton went into partnership with the publishers Claude Briasson, Michel-Antoine David and Laurent Durand, each of whom took up a sixth share in the venture, while Le Breton had three sixths. The royal privilege they obtained was dated 8 February 1746. Most important, the three partners introduced to Le Breton the man who had just edited for them a Dictionnaire de Médicine, Denis Diderot. This brilliant young man, unknown to the public and in very straitened circumstances, at once gained for the project the warm support of his already famous friend Jean d'Alambert, who not only wrote the Discours préliminaire, the general introduction to the Encyclopédie, and contributed the articles on mathematics, but used his assured position in society and the world of letters to obtain the moral and financial support of the leading salons and the cooperation of the best scholars and philosophes. Each volume as it appared caused a sensation throughout Europe. The court, the church, the judiciary were outraged; the number of subscribers, originally one thousand, rose to four thousand. In 1759, the seven volumes so far published were banned by the French Attorney General and condamned by the Pope. Frederic II of Prussia and Catherine II of Russia offered to have the work published in Berlin and St Petersburg. Le Breton, however, carried on clandestinely and in 1765 completed the tenth volume, the last according to the prospectus. But a rising young publisher, Charles-Joseph Panckoucke, continued the work until 1780. By that time, at least seven pirated editions of the Encyclopédie had been published in Geneva, Berne, Lausanne, Yverdun, Lucca and Leghorn.” (PMM). PMM 200; Brunet II, 700; Graesse II, 389; Ebert 6709.